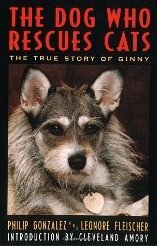 The Dog Who Rescues Cats is the remarkable story of a dog named Ginny who saved approximately 900 cats during her lifetime. After Philip Gonzales was disabled in a work-related accident, the formerly active and sociable Vietnam veteran slid into a severe depression. A concerned neighbour convinced him to adopt a shelter dog, hoping that caring for a pet would cheer him up. Gonzalez went to the animal shelter planning to adopt a big, tough-looking dog, so he was not particularly enthusiastic when a shelter worker suggested that he take a scruffy little Husky-Schnauzer cross named Ginny for a walk around the block. However, during that walk, Ginny stopped and forced Gonzalez to look at her. The two made a profound connection, and Gonzalez realized that he was dealing with a very special individual. Gonzalez adopted Ginny, and soon learned that his new dog had a mission in life: to save as many abused, abandoned, injured, orphaned, and starving cats as she could. Gonzalez was not a cat person and had been largely indifferent to felines before Ginny, but he soon caught Ginny’s infectious enthusiasm for rescuing them. He learned to appreciate the many cats that Ginny brought into his home, as well as the street cats she urged him to feed. Nearly every chapter of The Dog Who Rescues Cats by Philip Gonzalez and Leonore Fleischer details one of Ginny’s amazing rescues, beginning with her first – five little abandoned kittens trapped inside a pipe. Drawing upon her remarkable intuition, Ginny could sense cats in trouble even when they were blocks away, and was willing to take serious risks to save them. Ginny dragged Gonzalez to back alleys, abandoned buildings, dumpsters, and locked sheds to find starving, injured, trapped, or otherwise endangered cats, even running across broken glass at one point to rescue an abandoned kitten. Gonzalez soon learned that whenever Ginny made her special whimpering sound, it meant that there was a cat in trouble. He also discovered that whenever he went back to the shelter from which he’d adopted Ginny to say “hello” to the staff, Ginny would unerringly make a beeline for any cat that suffered from a disability, and she would beg Gonzalez to adopt it. Ginny and Gonzalez began regularly making rounds of their neighbourhood, feeding feral cats and bringing injured cats to a veterinarian for medical care as needed. Whenever they came across a disabled cat that would have been at a serious disadvantage in fending for itself, they adopted it into their own rapidly expanding household or found a home through the network of animal lovers with whom the pair had established connections. Ginny’s mission eventually made international headlines. She has been featured in news stories, television programs, radio shows, magazines, and websites, and has been the subject of two books, The Dog Who Rescues Cats and The Blessing of the Animals, also by Philip Gonzalez and Leonore Fleischer. In 1998, Ginny was named “Cat of the Year” by the Westchester Feline Club. Ginny also has a large fan club where people share their memories of her and their own cat stories. To learn more about Ginny and the many cats she rescued, view photos and videos of Ginny, or donate to the Ginny fund, visit the Ginny Fan Club.